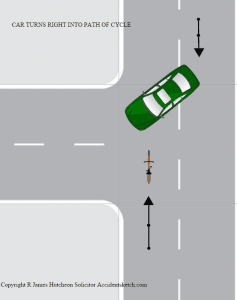 This typical accident claims example is a result of a driver of a motor vehicle not paying attention to the cyclist when turning right. The car proceeds to enter into the path of the cyclist in the opposite direction causing the accident and subsequent injury. The following video illustrates the typical scenario depicted above that injury solicitors will deal with and claim compensation for injuries sustained against the driver. The video features some bad language which you may expect given the circumstances.